A cancer diagnosis can be a lonely and trying experience for those at any age, but especially for a teenager. But Monday music recording session at Boise School of Rock will be unlike any other: harnessing the healing power of music to foster camaraderie. BOISE, ID — A cancer diagnosis can be an isolating experience to go through at any age, but especially as a teenager. But one local group of survivors flexed their creative side Monday, and according to a rep from Camp Rainbow Gold, these awesome teens don't want your pity-- they want to be rockstars with their friends just like everybody else. After all, what would our teen years be like without music from our favorite artists to get us through? "Teenagers are in a very important developmental stage of their lives," said Lesa Breding, a social worker and volunteer at Camp Rainbow Gold. For Nathan Kimes, that artist is Bryan Adams. "He writes these really heartfelt songs and I listen to them all the time." 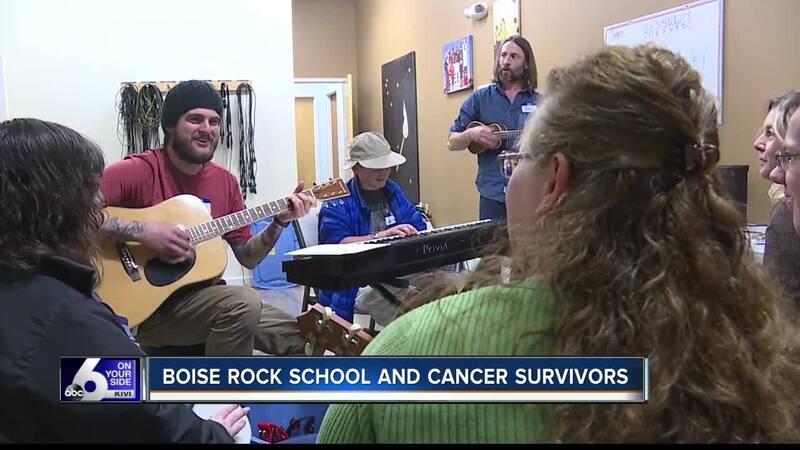 And Kimes-- a stage 4 cancer survivor since age 2-- emulated one of his heroes in a songwriting-themed night at Boise Rock School. "Sometimes when someone goes through what I've been through, it's hard to relate to others," said Kimes. "It can definitely turn their life upside down, and impact their social relationships," said Breding. Camp Rainbow Gold's teen peer group "Survivors Supporting Survivors" aims to help with that. "Being with other people who have experienced the same thing I have, uh, just makes things easier with each other and we all are understanding of one another," said Kimes. Survivors Supporting Survivors-- for teens ages 13 to 18-- is in its 11th year, and they meet up once a month, every month. The group "is designed to offer an opportunity for the teens to talk about the struggles of a cancer diagnosis without becoming a counseling group," according to Jason Hosick, Program Manager, Camp Rainbow Gold. But it is designed to be less of a counseling group ,and more of a peer group, according to Kimes and Breding. "Their internal experience of their heart or their mind, related to cancer or life in general, and to be able to extract that and put it down on paper and then maybe even write a tune to it," said Breding. And after a little bit of practice and a whole lot of giggles, the message in the music resounded loud and clear: "All of us at Camp Rainbow Gold we're more than just friends we're also kind of family as well," said Kimes. Just like all programs at Camp Rainbow Gold, the event is free for survivors to attend. According to their website, a typical agenda includes introductions, a 15-minute “Happy/Crappy” time to vent or celebrate, a mentor story and a guided discussion or activity. In addition, they "help the healing process happen much faster," to "guide them in real life challenges and allow them to discuss and support each other in ways you don’t see in normal life," according to a brochure from Hosick. You can learn more about Survivors Supporting Survivors on their website.